So one of the biggest challenges facing me with this pregnancy is what to wear to work while I'm getting more rotund and less comfortable. While the winter months have meshed well with my nonexistent and then slight baby bump, summer offers skirts and empire-waisted dresses to cover the growing swell. But shoes become a problem. My current fave shoes are dansko clogs; big, comfy, clumpy shoes that do a great job giving me foot support and a lousy job looking cute. And they will NOT work with summer dresses. Ballet flats, while looking great with skirts, are not so very nice to my swelling feet and ankles and, lets be honest here, summer = open toed shoes. I need sandals. 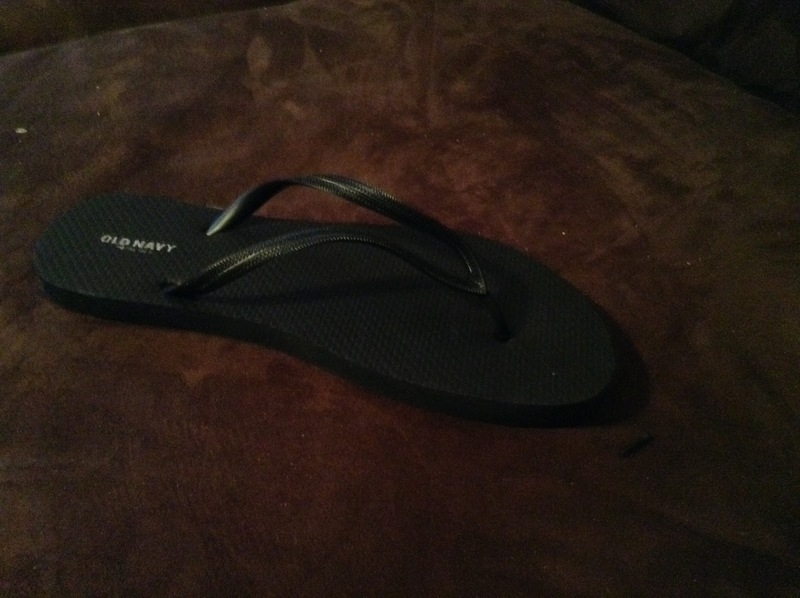 But sandals have three major problems: height, flip-floppeing and price. 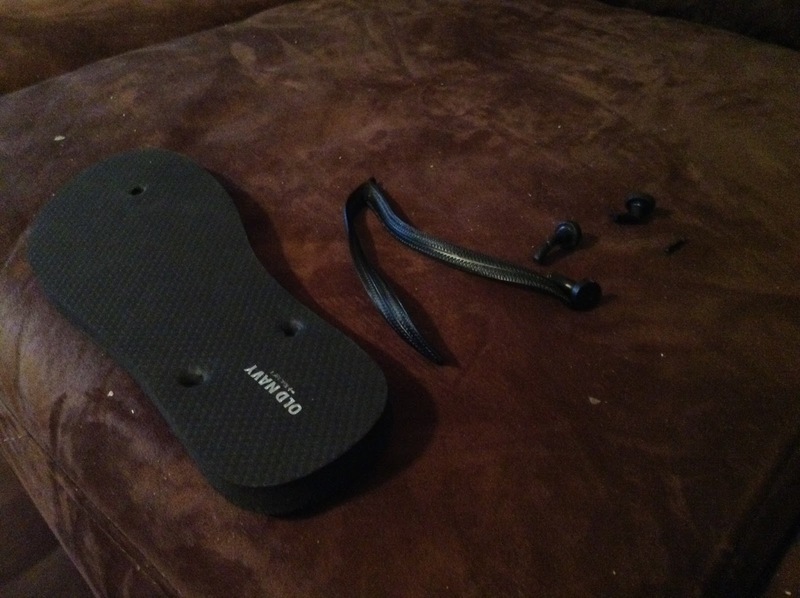 Because the high shoes, while offering enough cushion to help my lower back, are not good for my balancing abilities. 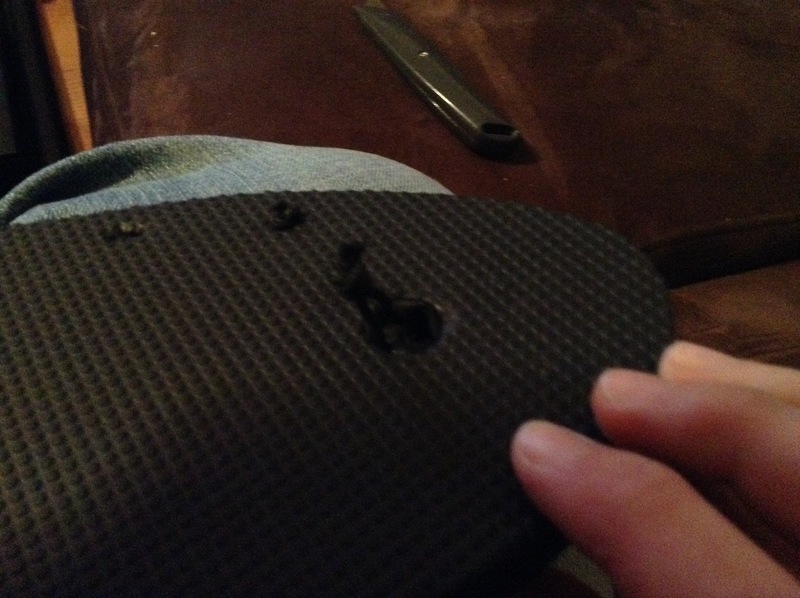 The thinner shoes, on the other hand, offer no cushion at all. Cushy sandals of a good height are inevitably flip flops (a HUGE no-no for the office). 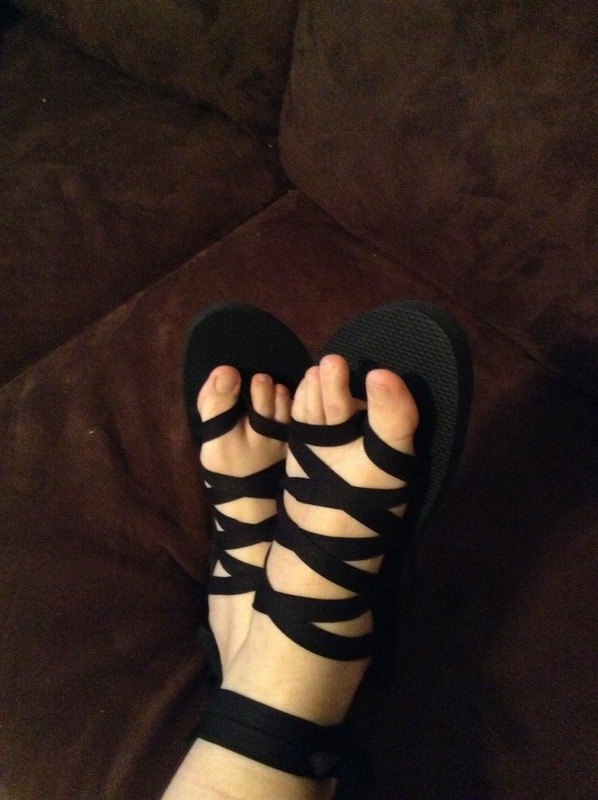 And the perfect combination of low heel, cushy, non-flip-floppy sandal are usually $60-80+. Not that I'm faulting the designer or shoe store, they gotta make a living too, but I am not plunking down that kinda moolah on a few strips of faux leather. 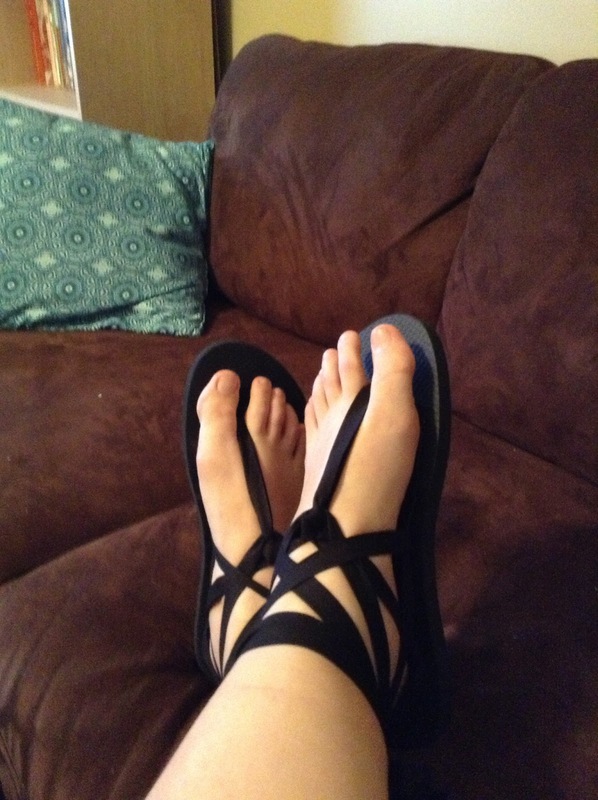 And with the vast creative design of Pinterest at my fingertips, I went forth on a quest to find a way to make a cheap pair of nice looking sandals. The results: zip. At least, zip for what I'm looking for. 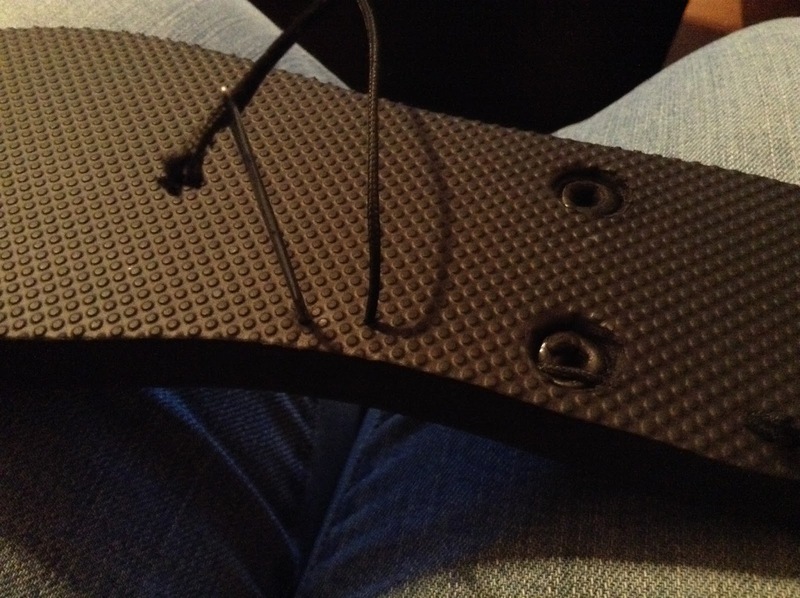 All the ones I found involved wrapping ribbon or leather straps around the existing foot strap, making a pretty flip flop, but a flip flop none the less. Further searching led me to this picture and hope! So here is my attempt to recreate these beautiful shoes using el-cheapo parts of the Wal-Mart variety. 70 inches of thin cord. I found a pack of waxed shoelaces, each was 27" long and I used 2.5 of them. The point is, you need a thin, strong cord that can be threaded through your needle and will stand up to walking around all day. I found mine at Old Navy, which sells two pairs for five dollars. 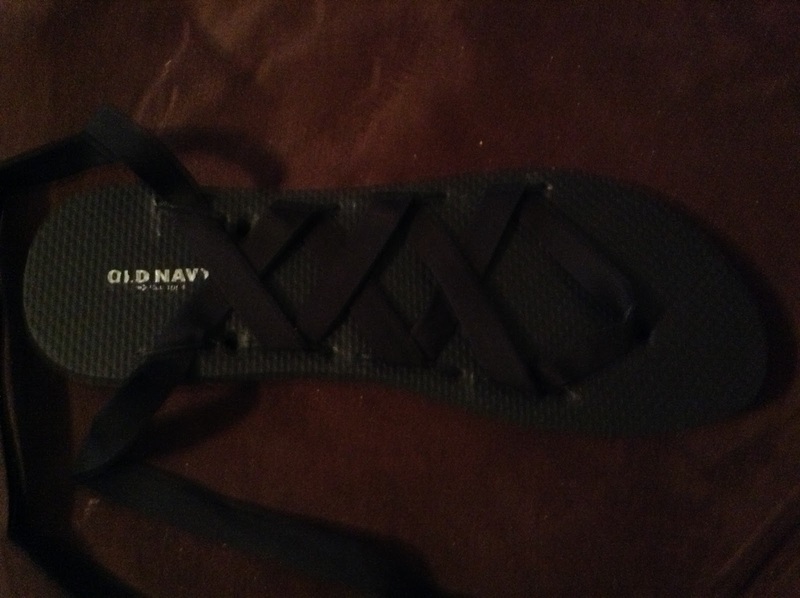 I intend to make two pairs of sandals, one black and one brown, but the tutorial only shows the black. Okay, got your stuff? Lets begin. 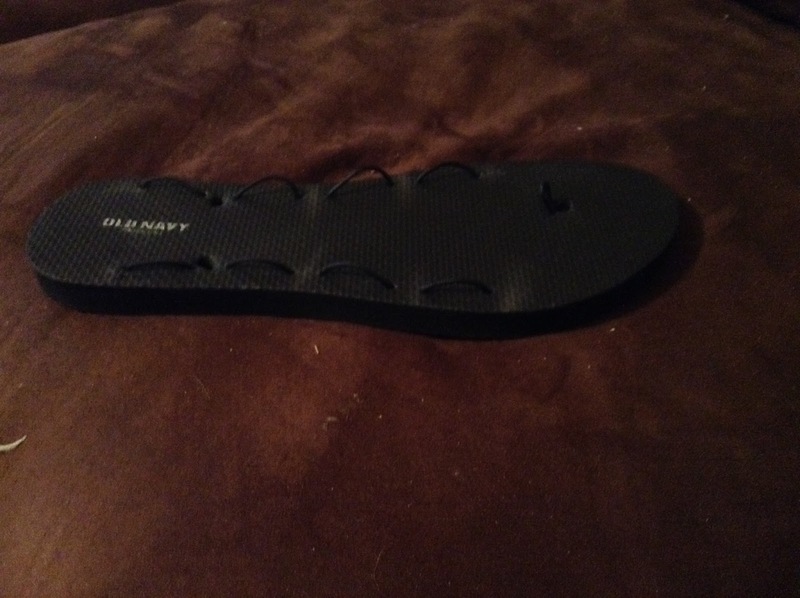 Cut the existing straps of the flip flop at the toe and ankle and pull the plugs off the bottom. Mark about where you want your loops to be. We are going to "sew" the cord on either side of these marks, so if you don't mark it perfectly, that's okay, you can adjust. Thread your cord through the needle and knot the other end. 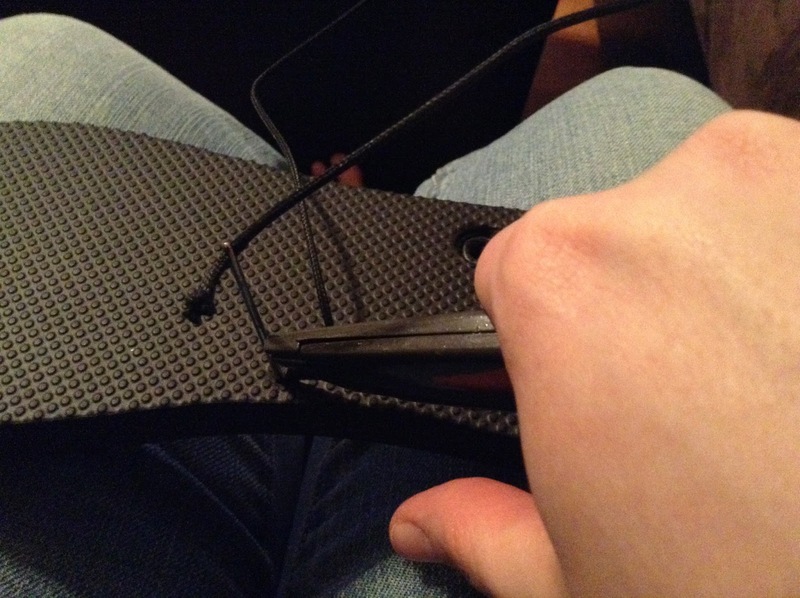 My waxed shoelace formed a really tight overhand knot, so I really didn't need to do anything fancier. Push the needle from the bottom up back by the heal. 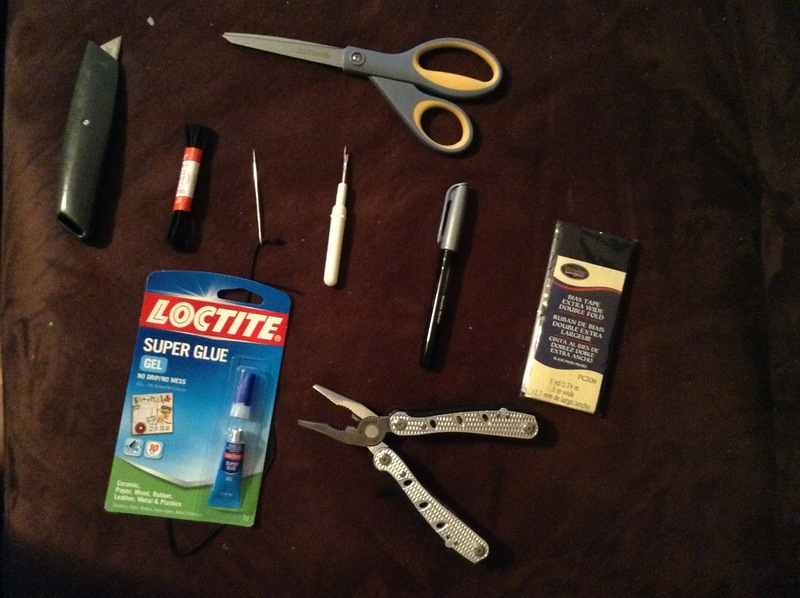 You will need your pliers to force the needle and thread through the plastic. This takes a lot of effort. 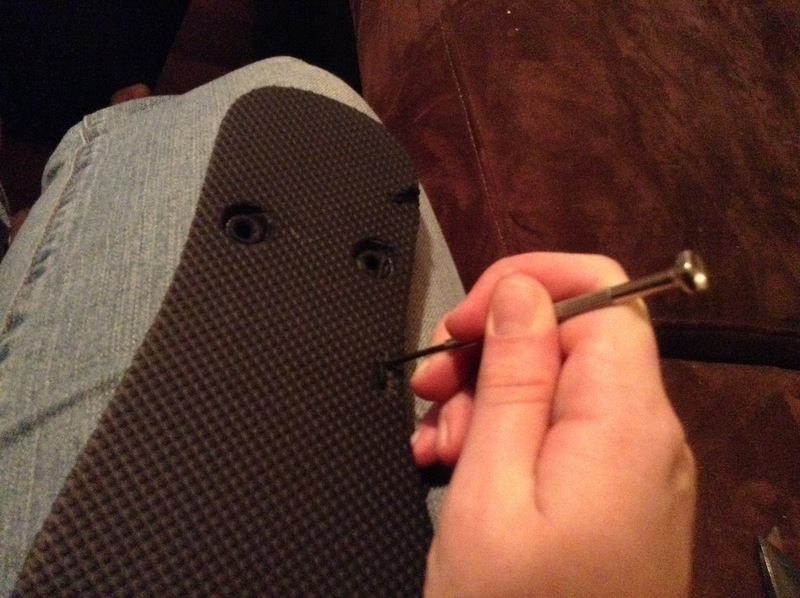 Go about an inch down the shoe towards the toe and push the needle back through. You don't need the top loop all that tight. A little bit of give will help you later when you pass your ribbons through the loops. Back on the bottom, position your needle about a 1/4" along from where you came down from the top and then push your needle only half way through the plastic. Take the exacto knife and cut a shallow incision connecting where the cord comes out and where the needle goes in. Push the needle all the way through and then use your poky instrument to jam the cord into the slit. 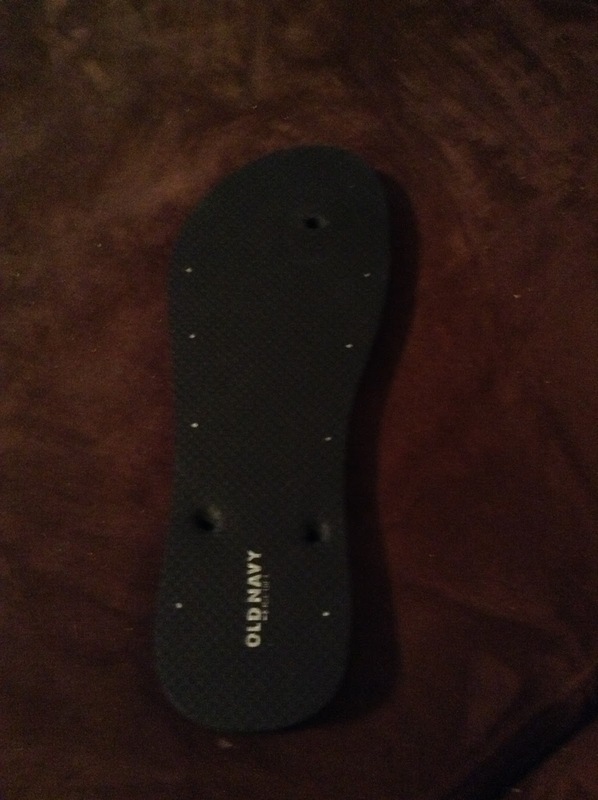 This will protect it from wearing too fast when you walk. Repeat steps 5 and 6 until you have four top loops, with the cord ending up on the bottom. Tie an overhand knot and cut the string. 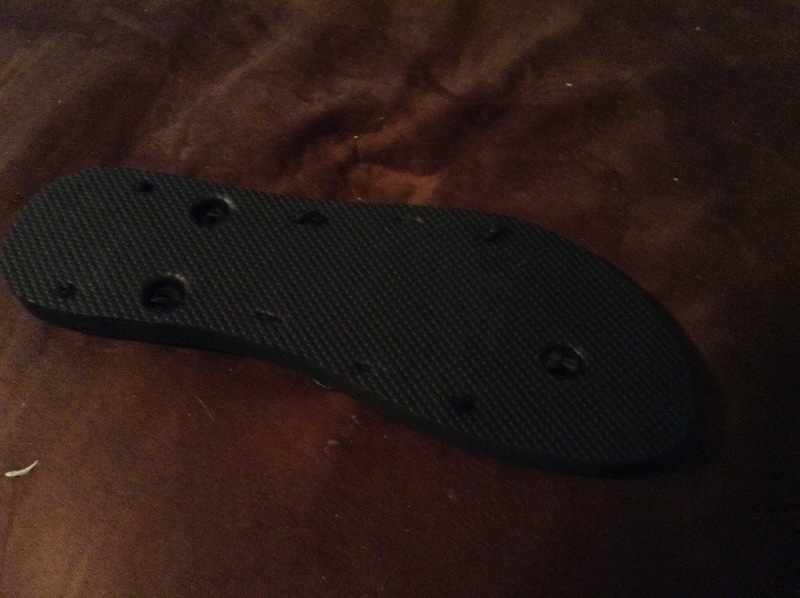 Repeat down the other side of the shoe. For the toe anchor: push your needle through the thin rim of plastic that would stop the plug from popping out the top of the shoe. Make a smallish loop and press the needle back down to have the two tails on the other side. Overhand knot these two together and then pull the loop up the top, so that the knot is tucked into the existing hole. * I chose to fold my bias tape in half one more time and sew it shut after making this tutorial. It looks more like ribbon, it's a bit thinner, and I think it'll hold up longer. This is personal preference. If you like the wide look or want to use ribbon, that is your choice and it'll still work fine. One last thing: I was thinking I needed superglue to fill in the incisions where the cord got tucked in, this is optional. If you want to, do it. If not, no worries. Now, practice ways to lace your new sandals. Please ignore my pasty-white, pregnancy-swollen feet. *You* will look fabulous! Closets and Organizing and Piles Oh My!